Prospects now look good for high-speed bus transit coming to Southeast Michigan in a few years' time. For folks in West Michigan’s biggest city, however, it has already arrived. This past August, Grand Rapids became the first place in the state to implement Bus Rapid Transit (BRT). 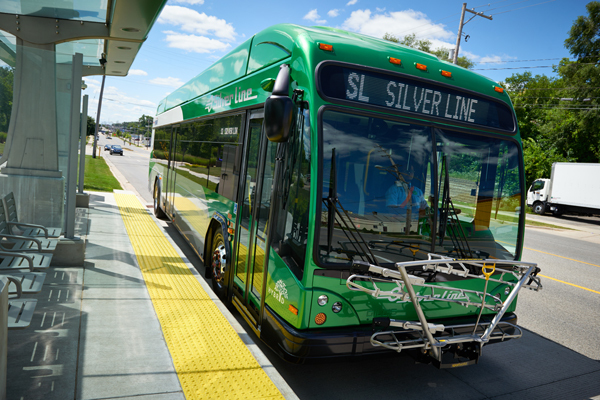 This service, the Silver Line, connects downtown Grand Rapids with its medical district, other large employment centers and the neighboring communities of Kentwood and Wyoming. Last month, Mode Shift joined a trip to Grand Rapids organized by the transit services company, Freshwater Transit, to see the Silver Line. The Nov. 20 outing, which included participants from Lansing and Metro Detroit, served as a follow-up to an earlier Freshwater excursion to see Cleveland’s HealthLine. Upon reaching Grand Rapids, the Freshwater group was treated to a presentation by Michael Bulthuis, Public Outreach Coordinator for The Rapid, the authority that runs both the Silver Line and the region’s regular bus system. The Silver Line consists of 10 hybrid-electric BRT buses. They travel a 9.6 mile route that runs along Division Avenue from 60th Street up to Wealthy Street before turning into a downtown loop. Passengers are picked up and dropped off at 34 BRT stations. 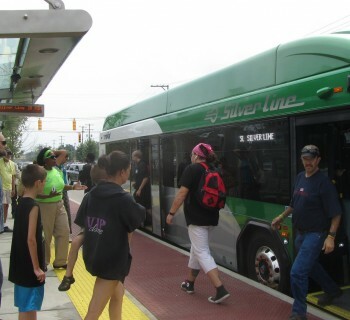 The Silver Line runs seven days a week with hours mirroring conventional buses. Service is 10 minutes during peak hours and 20 minutes at other times. Standard fares are $1.50, the same as a regular bus ride. Riders caught dodging fare face steep fines, ranging from $65 to $250. ●Prepaid boarding at fare vending kiosks located outside at each station. ●Platforms that are built level with buses to speed up boarding. ●Special technology that give buses traffic signal priority, meaning lights will stay green longer as they approach. ●Special semi-exclusive lanes designated for BRT buses at peak travel times. The system also comes with amenities like WiFi, bike racks and parking, free Park-and-Ride car parking and an electric sidewalk snow-melting system. BRT buses run about 40 percent faster than regular ones on Division Street, according to Bulthuis. Although ridership is still building, August figures show the Silver Line tallying at least 2,000 riders daily. Bringing BRT to Grand Rapids took about ten years, from initial transit studies to last summer’s opening. Construction lasted a little over a year. A millage approved in 2011 helps The Rapid meet about a third of its operational costs. That victory came after an unsuccessful transit millage effort in 2009. Bulthuis said strong educational outreach and bundling BRT with other transit services in the 2011 ballot proposal were critical to getting it passed. According to Bulthuis, planners had multiple reasons for bringing BRT to Grand Rapids, including improving regional mobility and facilitating economic development. Following the presentation, the Freshwater crew took a quick ride on a BRT bus. As the group departed the central bus station, 18-year-old Monica Sosa, a Silver Line regular, shared her views on the service. "It's actually better than the original buses," she tells Mode Shift, "because they get you where you want to go quicker. And they’re warmer and have comfortable seats." 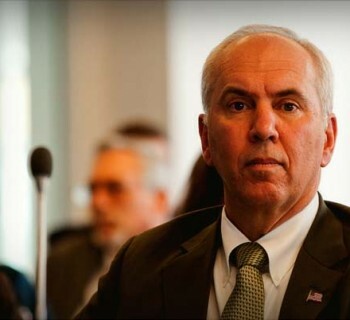 Mode Shift spoke with rider John Eisenschenk, 55, while riding the Silver Line. That said, he did note a few hiccups. Initially there were some issues getting fare machines running smoothly, according to Eisenschenk. He adds that a bus-only right turn in the medical district sometimes confuses other motorists. Jen Torrico, Freshwater’s Community Relations Director led the Silver Line trip. Comparing Grand Rapids system to Cleveland’s, she said both had their strengths. Perhaps, the most striking lesson she took away for transit advocates dealt with finances. The proposed Metro Detroit BRT line would connect 11 communities, from Detroit to Pontiac, along a 27-mile stretch of Woodward Avenue. A plan for that project is currently undergoing federal environmental review. 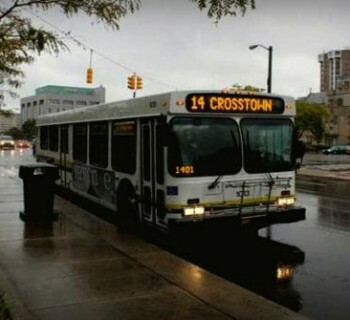 If it’s approved, that service would be implemented and operated by the Southeast Michigan RTA.